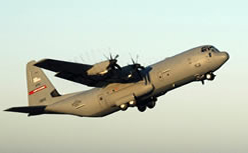 The C-130 Hercules primarily performs the tactical portion of the airlift mission. 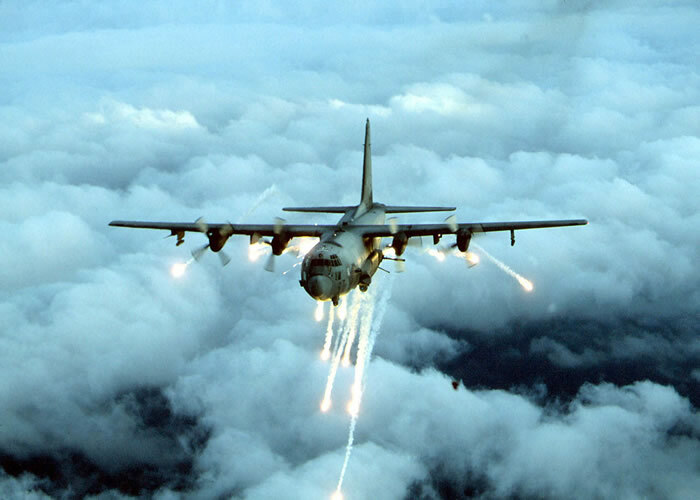 The aircraft is capable of operating from rough, dirt strips and is the prime transport for air dropping troops and equipment into hostile areas. 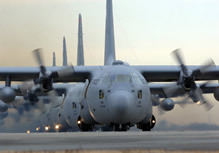 The C-130 operates throughout the U.S. Air Force, serving with Air Mobility Command (stateside based), Air Force Special Operations Command, theater commands, Air National Guard and the Air Force Reserve Command, fulfilling a wide range of operational missions in both peace and war situations. 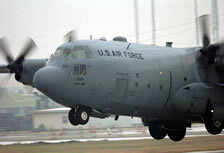 Basic and specialized versions of the aircraft airframe perform a diverse number of roles, including airlift support, Antarctic ice resupply, aeromedical missions, weather reconnaissance, aerial spray missions, fire-fighting duties for the U.S. Forest Service and natural disaster relief missions. 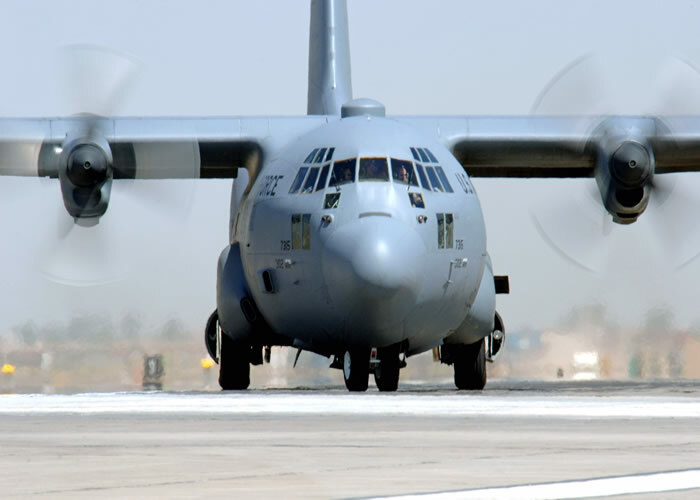 Using its aft loading ramp and door the C-130 can accommodate a wide variety of oversized cargo, including everything from utility helicopters and six-wheeled armored vehicles to standard palletized cargo and military personnel. In an aerial delivery role, it can airdrop loads up to 42,000 pounds or use its high-flotation landing gear to land and deliver cargo on rough, dirt strips. The flexible design of the Hercules enables it to be configured for many different missions, allowing for one aircraft to perform the role of many. Much of the special mission equipment added to the Hercules is removable, allowing the aircraft to revert back to its cargo delivery role if desired. 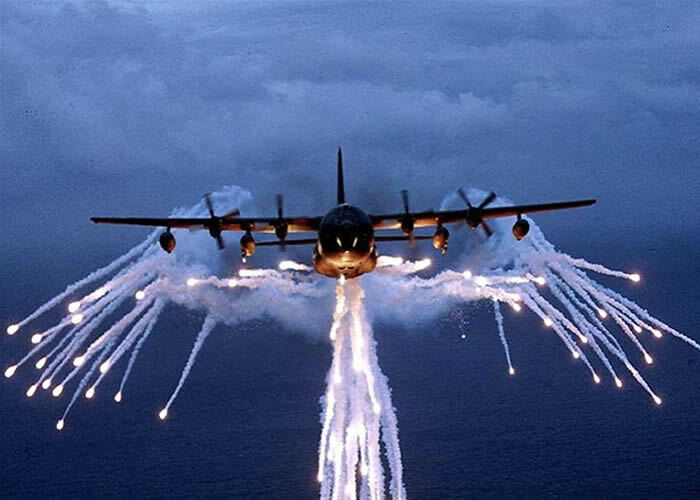 Additionally, the C-130 can be rapidly reconfigured for the various types of cargo such as palletized equipment, floor-loaded material, airdrop platforms, container delivery system bundles, vehicles and personnel or aeromedical evacuation. The C-130J is the latest addition to the C-130 fleet and will replace aging C-130E's. 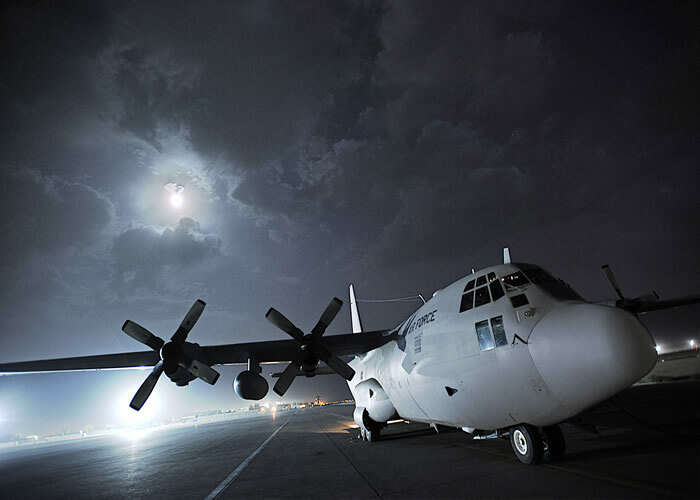 The C-130J incorporates state-of-the-art technology to reduce manpower requirements, lower operating and support costs, and provides life-cycle cost savings over earlier C-130 models. 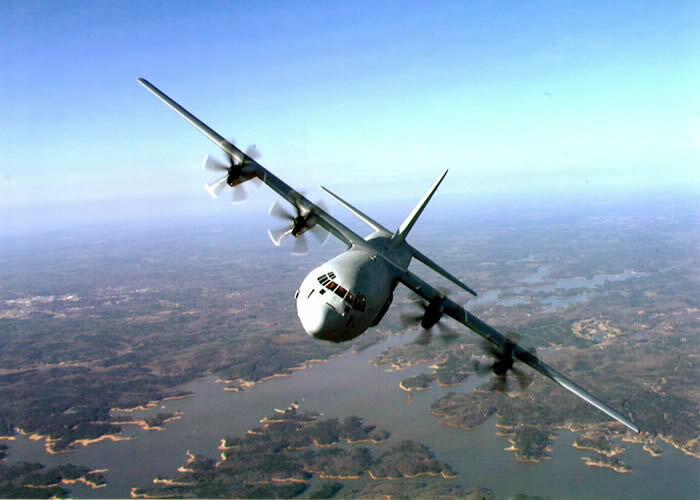 Compared to older C-130s, the J model climbs faster and higher, flies farther at a higher cruise speed, and takes off and lands in a shorter distance. The C-130J-30 is a stretch version, adding 15 feet to fuselage, increasing usable space in the cargo compartment. C-130J/J-30 major system improvements include: advanced two-pilot flight station with fully integrated digital avionics; color multifunctional liquid crystal displays and head-up displays; state-of-the-art navigation systems with dual inertial navigation system and global positioning system; fully integrated defensive systems; low-power color radar; digital moving map display; new turboprop engines with six-bladed, all-composite propellers; digital auto pilot; improved fuel, environmental and ice-protection systems; and an enhanced cargo-handling system. Four decades have elapsed since the Air Force issued its original design specification, yet the remarkable C-130 remains in production. The initial production model was the C-130A, with four Allison T56-A-11 or -9 turboprops. A total of 219 were ordered and deliveries began in December 1956. The C-130B introduced Allison T56-A-7 turboprops and the first of 134 entered Air Force service in May 1959. Introduced in August of 1962, the 389 C-130E's that were ordered used the same Allison T56-A-7 engine, but added two 1,290 gallon external fuel tanks and an increased maximum takeoff weight capability. June 1974 introduced the first of 308 C-130H's with the more powerful Allison T56-A-15 turboprop engine. 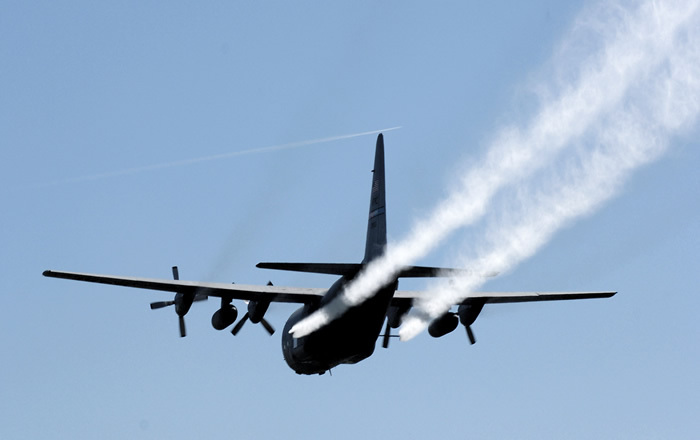 Nearly identical to the C-130E externally, the new engine brought major performance improvements to the aircraft. The latest C-130 to be produced, the C-130J entered the inventory in February 1999. With the noticeable difference of a six-bladed composite propeller coupled to a Rolls-Royce AE2100D3 turboprop engine, the C-130J brings substantial performance improvements over all previous models, and has allowed the introduction of the C-130J-30, a stretch version with a 15-foot fuselage extension. Air Force has selected the C-130J-30 to replace retiring C-130E's. Approximately 168 C-130J/J-30s are planned for the inventory. To date, the Air Force has taken delivery of 32 C-130J aircraft from Lockheed Martin Aeronautics Company with orders for approximately 46 more aircraft. Aeromedical Evacuation Role: Minimum medical crew of three is added (one flight nurse and two medical technicians). Medical crew may be increased to two flight nurses and four medical technicians as required by the needs of the patients. Inventory: Active force, 186; Air National Guard, 222; Air Force Reserve, 106.